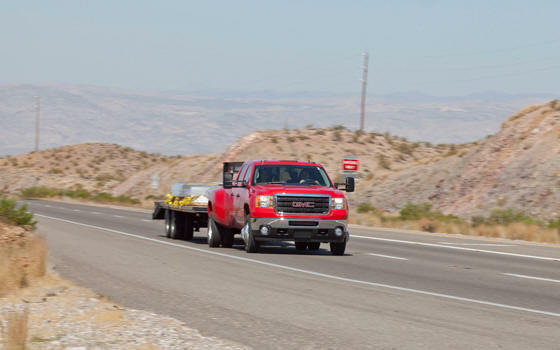 During the last HD Shootout, we performed 60-to-zero-mph brake tests to measure stopping distances from 60 mph with the trucks empty and with 2,000 pounds of ballast in their cargo boxes. Instead of repeating that test, this time we measured brake performance with the trailers attached. 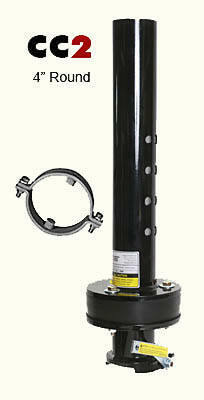 Hurt Locker part 2 for heavy duty one ton trucks towing Titan Trailers. 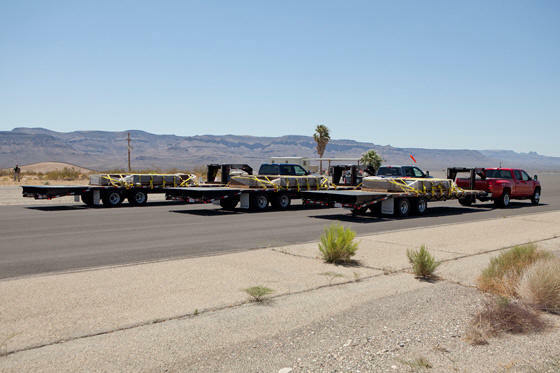 Each truck was tested twice, side-by-side with the other trucks, in two tests. Tow/haul mode was on. 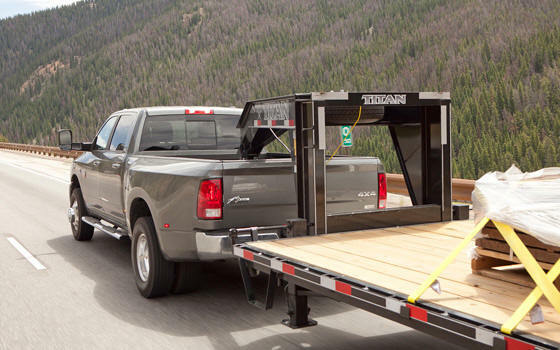 The exhaust brakes on the Ram and GM trucks were enabled while towing. The Ford’s exhaust brake is automatically enabled when the truck is in tow/haul mode. Because of the heavy weights involved, we tested stopping power from 40 mph to zero, but we changed things up a bit. In the first round, the trucks were connected to the trailers via the 7-pin electrical connection, so the trucks’ integrated trailer brake controllers could manage the trailer brakes when we applied our foot to the service brakes inside the truck. 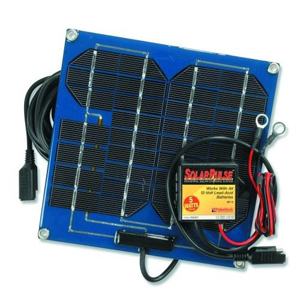 In the second round, we disconnected the electrical connection, so the truck brakes were forced to stop the entire rig — truck and trailer — without any assistance from the trailer brakes. Why did we do this? 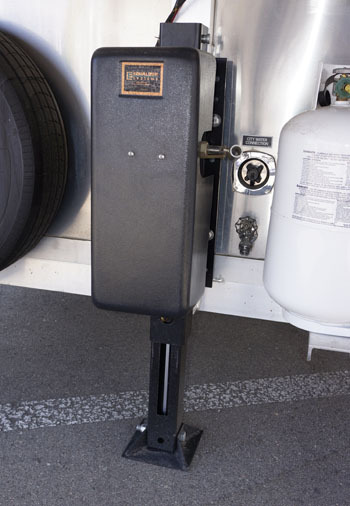 The importance of testing trucks without the electrical connection to trailers demonstrates a common problem with 7-pin trailer plug connections. 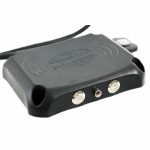 In the RV7-type connection, standard on all pickups today, the male-to-female connection isn’t locked tight. 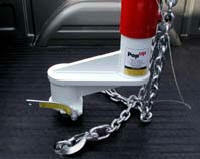 It depends on friction from a brass wedge sliding against a metal blade in 7 places to hold the plug in place. Over time, the plugs flex with truck movement, causing electrical arcing and voids that allow dirt and water in, which can lead to corrosion over time. 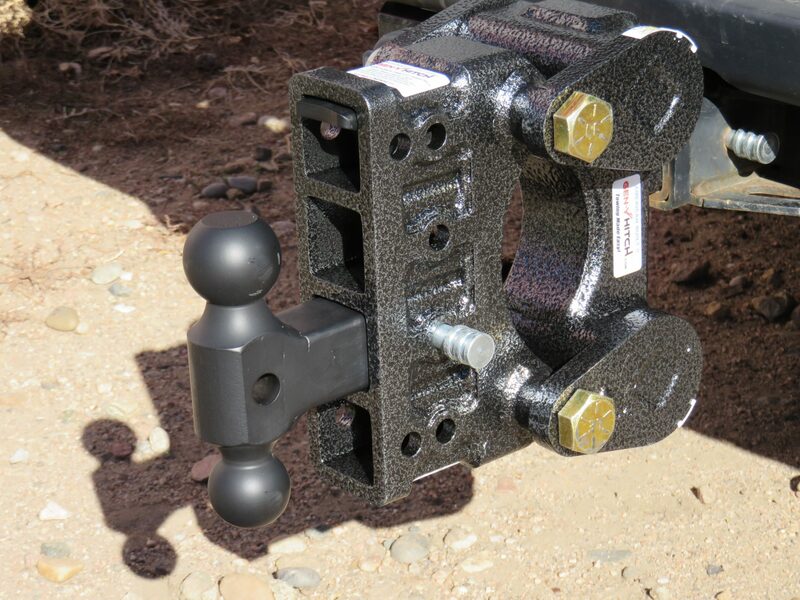 Whether it breaks, corrodes or pulls away, if you lose connection from truck to the brake or ground wires in the trailer plugs, you lose the trailer brakes. This is why you should check your 7-pin connector often and regularly. 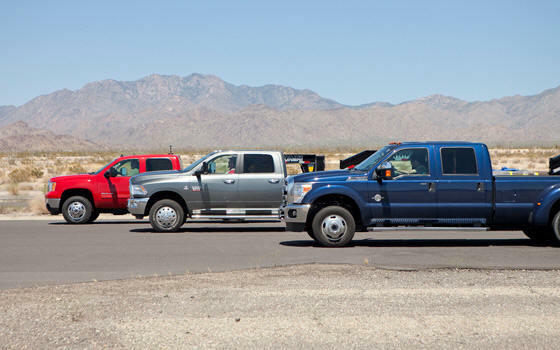 In contrast to our earlier, faster brake test with payload where the GMC Sierra 3500 excelled, this time the Ford F-350 had the best stopping power, followed by the Ram 3500. The Ford needed only 94 feet to stop compared with more than 100 feet for the Ram and Sierra. 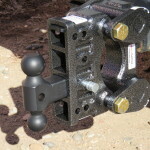 Stopping distance grew dramatically when we disconnected the trailer connections, by an average of about 50 percent. The Ford still came to a halt in the shortest distance – 143 feet, about 20 feet sooner than the Ram (164 feet) and Sierra (165 feet). Why did the Ford perform so much better in this brake test than the GMC and Ram trucks? Even though Ford has the smallest brake rotors in the class (13.7 inches front and 13.4 inches rear compared with 14 inches for the GMC and 14.1 inches for the Ram), it appears to manage ABS more effectively with or without trailer attached. The lack of any “disconnected trailer brake” signal to the truck didn’t seem to change what the yaw signal was to the Ford. The GMC Sierra with trailer brakes connected seemed to give confusing signals to the ABS computer, not allowing full brakes as the truck slowed down, allowing it to roll forward to pass the stopped Dodge at slow speed. 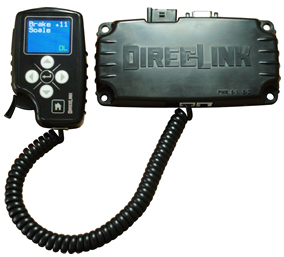 Ford and GM use truck brake hydraulic pressure from the master cylinder to activate the integrated trailer brake controller, whereas the Ram’s trailer brake controller relies on an integrated accelerometer. This means Ford and GM don’t require trailer movement to activate the brakes, while Ram measures the movement of the trailer to help manage brake application. All three brands’ integrated trailer brake controllers use accelerometer-based motion readings when the ABS computer takes over during hard braking. After nearly four years of deliberation and negotiation, truck manufacturers and the Society of Automotive Engineers are expected to agree to the industry’s first tow testing standards for pickups by late this year. The standard, known as J2807, establishes tow-vehicle performance requirements against the following criteria to establish maximum ratings: timed acceleration on level ground and up a 12 percent incline; maintaining speed on a real-world grade; understeer; trailer-sway response; braking and park brake at gross combined weight; and tow-vehicle hitch/attachment structure. 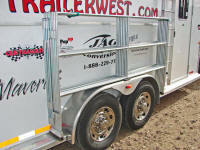 To minimize test variations, J2807 provides standard test trailer specifications and requirements for use in these tests. Once J2807 is implemented, truck buyers will finally have an apples-to-apples comparison for the trailer-towing capacity of all light-duty pickups. All manufacturers are expected to follow it starting with the 2013 model year. PickupTrucks.com is using parts of the standard for testing, including the standardized hill climb at Davis Dam Grade. 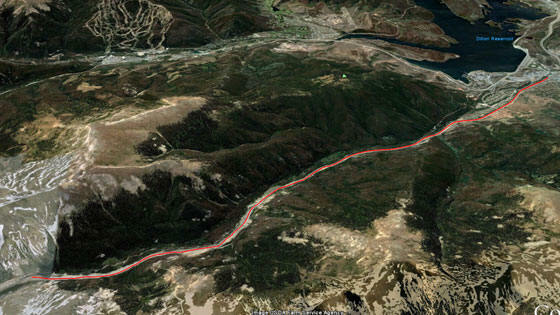 Topographical map of Davis Dam Grade based on GPS data collected by our VBOX and exported to Google Earth. 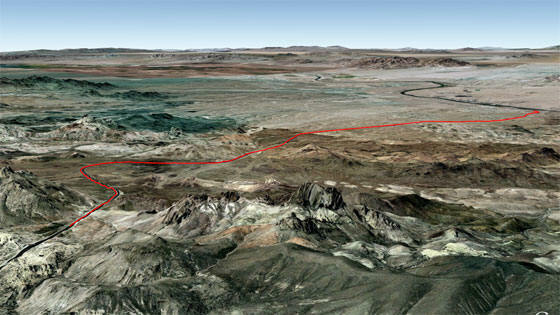 The red line representing our timed course starts at the upper right (near the Colorado River) and finishes 59,000 feet (11.17 miles) later in the lower left at Union Pass. Each truck had two clean runs up the grade at wide open throttle from start to finish. Runs during which the driver let off the accelerator, braked or both were not counted. The trucks were in tow/haul mode, with the exhaust brakes on and the air conditioning set to maximum for the entire climb. The first run was completed late in the afternoon. The second run was completed the next morning. We averaged the two runs to calculate the fastest time. Despite the grade’s length and the hot temperatures, which we thought would expose and exaggerate any weaknesses in cooling or power, all of the trucks were very competitive. 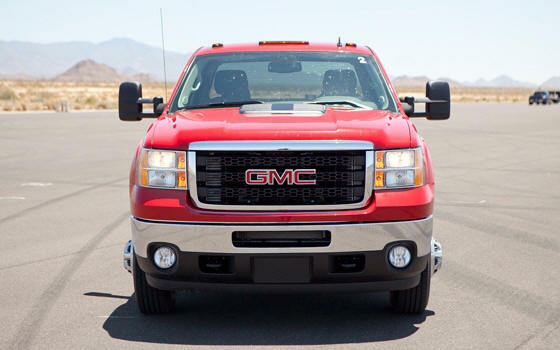 The Ford F-350 and GMC Sierra sparred fiercely with each other for the fastest time. The Ford was fastest on the first run and the GMC was fastest on the second. GMC’s average time up the hill was 11.5 seconds faster than the Ford’s time. The Ram 3500 finished just more than a minute behind the F-350. This chart shows each truck’s speed climbing Davis Dam Grade against the clock at wide open throttle. The GMC Sierra 3500’s fastest run was 671.3 seconds, the Ford F-350’s best time was 710.8 seconds and the Ram’s quickest climb was 774.2 seconds. The sloped lines represent each truck’s position climbing the mountain. This chart shows the speeds of the three trucks relative to each other over the 59,000 foot (11.17 mile) run to the top of Davis Dam Grade. Note how similar the speed patterns are for each truck as the grade changes throughout the climb. The GMC Sierra 3500’s quickest time up Davis Dam was 11 minutes, 11.3 seconds, and its average speed pulling from 500 feet up to 3,000 feet in elevation was 58.35 mph. 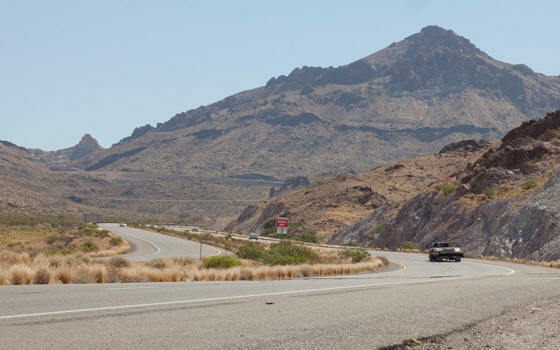 Top speed was 69 mph for a few moments where the highway’s slope decreased to 3 percent for several hundred yards. The Ford F-350’s best time up the grade was 11 minutes, 50.8 seconds at an average speed of 54.9 mph. Its top speed was 63.15 mph. 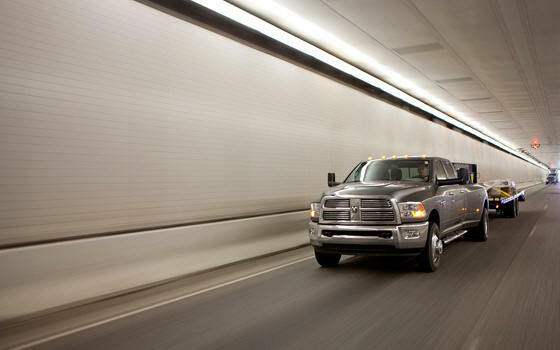 The Ram’s fastest run was 12 minutes, 54.2 seconds at an average speed of 50.64 mph. 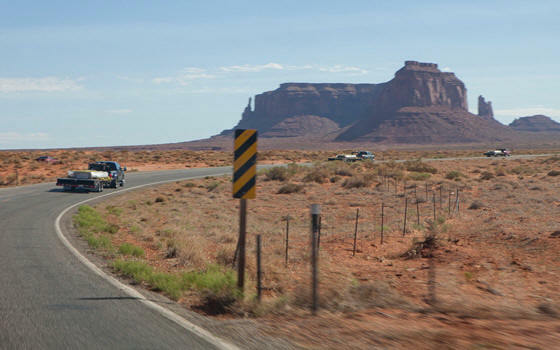 Its top speed was 62 mph, at the same spot the GMC and Ford hit their top speeds. Of the three trucks, the Sierra ran coolest up the hill, even when the outside temp was more than 100 degrees. Coolant temp climbed by just 3 degrees, from 187 to 190, and transmission temp ranged from 210 to 215. While the Ford was almost as fast as the GMC, its powertrain ran hotter. Coolant peaked at 231 degrees, and the transmission temp hit as high as 216. The Ram stayed cooler than the Ford but warmer than the GMC. Coolant temp topped out at 226 degrees, and the transmission hit 213. All the trucks’ engine fans turned on during their runs to cool things down, but the Ram’s fan was the loudest. The Ram also had the roughest shifts and seemed to have difficulty figuring out whether to stay in 3rd or 4th gear, hunting for a sweet spot among the two gears. 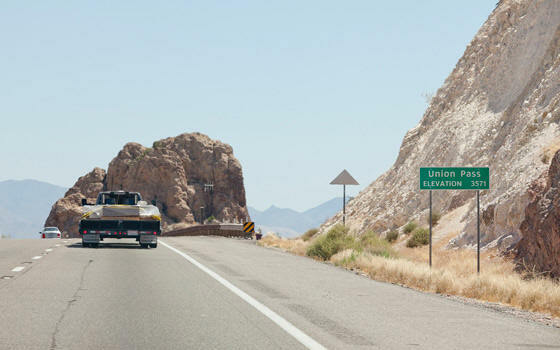 It’s worth noting that all three trucks would have easily passed the SAE J2807 minimal speed standard, which is 35 mph on Davis Dam Grade for a dually one-ton pickup with a gross vehicle weight rating of 13,000 pounds or less. We didn’t just time the trucks up the grade. 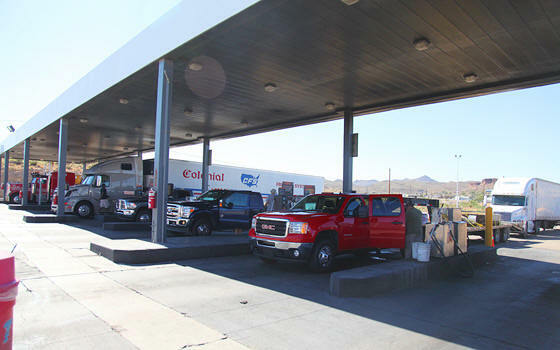 We also evaluated their exhaust-brake performance while heading back to Bullhead City with the 19,400-pound trailer pushing these dually HDs on their trips downhill. An exhaust brake saves on brake and transmission wear by clamping down the engine’s turbo vanes, creating back pressure to engine-brake the truck. It also reduces the potential for brake fade during long descents, increasing downhill safety and overall wheel brake life. 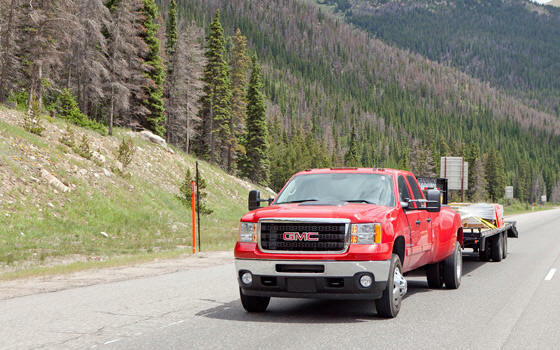 The GMC Sierra and Ram 3500 have push-button-activated exhaust brakes that can work in or out of tow/haul mode, while the Ford F-350’s exhaust brake is enabled only when the truck is in tow/haul. Unlike the Duramax and Cummins, the Ford’s exhaust brake can’t be turned off. Cruise control was not used. Example graph of one of several exhaust brake runs in the Ford F-350 towing 19,400 lbs. (approximately 28,400 lbs. combined weight, including three adult males). Six brake applies can be seen here, immediately after speed peaks exceeded 60 mph. Wheel brakes were applied until speed was reduced to approximately 48 mph, to keep the truck in a narrow band between 50 mph to 60 mph. At the start, we crested Union Pass westbound and set our speed to 55 mph. Then we waited for gravity to take over and the trucks to exceed 60 mph, at which point we applied the wheel brakes to lower our speed to approximately 48 mph to start the pattern over again. We counted the number of times the wheel brakes were applied. The truck with the fewest brake applies wins. We’ve always liked the Ram’s exhaust brake, which was designed and engineered by Cummins. 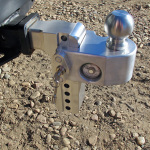 During last year’s HD Shootout, we considered it a stronger exhaust brake than the one recently added to the Duramax. That belief proved itself on the downhill run from the top of Highway 68. As measured for the trucks’ best downhill runs, we had to apply the Ram’s wheel brakes only twice to keep the Ram one-ton in the 50 mph to 60 mph range. The GMC Sierra 3500 required four brake applies, and the Ford F-350 required five. Our second major climb was the eastbound ascent from Dillon, Colo., to the top of Eisenhower Pass on Interstate 70, the highest point in the U.S. interstate system. The grade starts at approximately 5 percent for two miles and then increases to about 7 percent for the remaining six miles, to the entrance of the Eisenhower Tunnel — the highest vehicular tunnel in the U.S. It’s perhaps the toughest stretch of road a loaded truck will encounter on a major cross-country highway; we call it the Nürburgring of pickup trucks because nearly every bit of towing and braking hardware is stressed to the max for many miles at a very high altitude. We started at 8,776 feet in Dillon and finished at 11,000 feet above sea level, climbing 2,224 feet over nearly eight miles and 7,500 feet higher than the finish on Davis Dam Grade. We drove each truck up the grade in tow/haul mode and two-wheel drive. Runs during which the driver let off the accelerator, braked or both were not counted. The fastest time was used for our comparison. We ran each truck up the grade in sequence, two times total. Each run included five adult males inside, adding another 1,000 pounds to the trucks. The trucks were at a dead stop before each run. The driver ran wide open throttle from start to finish. We didn’t encounter any traffic on the road during the late-night climbs. Topographical map of Eisenhower Pass based on GPS data collected by our VBOX and exported to Google Earth. The red line representing our timed course up I-70 starts near the upper right, in Dillon, Colo., and finishes 40,000 feet (7.6 miles) later in the lower left, near the entrance to the Eisenhower Tunnels at 11,000 feet above sea level. Temperatures at the start of the runs in Dillon ranged between 54 degrees and 62 degrees, according to the trucks’ outdoor temperature readouts. Like the Chevy Silverado 3500 that won the Rumble in the Rockies test, the Duramax-powered GMC Sierra 3500 was the fastest truck up Eisenhower Pass. 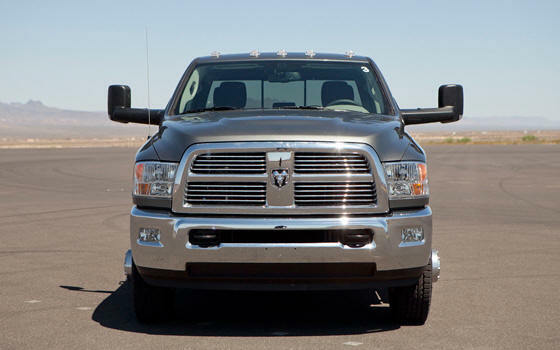 It finished in 8 minutes, 46.8 seconds – 84 seconds ahead of the F-350 and 152.6 seconds ahead of the Ram 3500. The Sierra’s average speed cruising up to 11,000 feet was 51.70 mph, 7.2 mph faster on average than the Ford and 11.35 mph faster on average than the Ram. The GMC’s top speed was 68.77 mph for a few seconds before the grade changed from 5 percent to 7 percent. The Ford F-350’s best time up the grade was 10 minutes, 16.6 seconds, at an average speed of 44.51 mph. The top speed was 58.5 mph, and it happened just before the point where the grade increased from 5 percent to 7 percent. Some may notice that the Ford was much closer to the GMC in performance this time around compared to the Rumble in the Rockies. We noticed that improvement, too, even before we looked at the numbers. This chart shows each truck’s speed climbing Eisenhower Pass against the clock at wide open throttle. The GMC Sierra 3500’s fastest run was 526.8 seconds, the Ford F-350’s best time was 611.1 seconds and the Ram’s quickest climb was 679.4 seconds. The sloped lines represent each truck’s position climbing the mountain. This chart shows the speeds of the three trucks relative to each other over the 40,000 foot (7.6 mile) run to the top of Eisenhower Pass. Note how similar the speed patterns are for each truck as the grade changes throughout the climb. 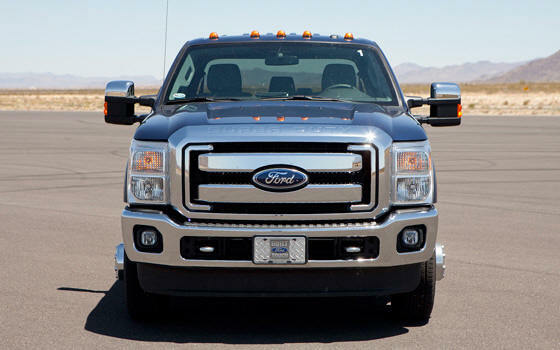 It seems as if Ford has improved the Power Stroke V-8 diesel’s performance at high altitudes. 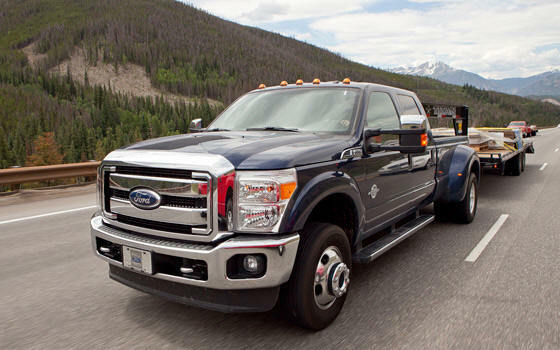 Last year, we tested a Ford F-450 and an F-350 in the Rocky Mountains, and neither truck was able to exceed 2,100 rpm at wide open throttle up I-70 when towing a heavy trailer. But in this test, we repeatedly saw the Ford hit and hold rpm levels as high as 2,700 rpm – just below its peak horsepower, which is critical for pulling with confidence and strength over long distances. And, in general, driving through the Rockies, without instrumentation running, there were times the Ford Super Duty could pull away (slowly) from the Sierra while climbing grades. 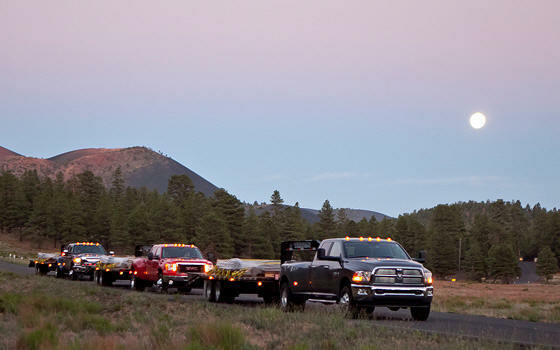 If we assigned a ratio to our impressions, the Ford outpowered the GMC about 25 percent of the time in the Rockies while towing. How was this F-350 able to dig deeper than the other 2011 Super Dutys we’ve driven? We suspect that Ford has continued to refine the Job 2 engine and transmission calibrations (Job 3?) to improve high-altitude performance. We have asked Ford for a comment, but we haven’t received a response as of this writing. We stopped at a Ford dealer in Denver to identify the firmware version, but the service computer only said the firmware did not require an update. We don’t think Ford submitted a “ringer” for this test. If there’s a firmware update for this truck, you could take your 2011 Super Duty in for service and have it flashed to the same version as this truck. Wherever the change comes from, it’s welcome. We repeated the exhaust brake test on the westbound descent back to Dillon. Eisenhower averages a 2 percent steeper grade than Davis Dam, and that 2 percent made a big difference in slowing the 14-ton fully burdened rigs (trailer, truck and five adult males). The finishing order changed, with the Sierra requiring five brake applies, the Ram 12 and the Ford 13. What happened to the Ram? Before we explain, we’ll note that we had both a GM and a Ram engineer in the cab with us (two of the five passengers) during this testing. If there’s a glaring weak spot with the High Output Ram, it’s the six-speed automatic transmission. The Cummins’ exhaust brake is willing and able to slow the truck, but it doesn’t seem to have the full cooperation and support of the gearbox. By contrast, this is where the GMC’s Duramax and Allison transmission form a formidable team. By itself, the Duramax exhaust brake doesn’t feel as strong as the Ram’s, but to make up for this, the exhaust brake and transmission work extraordinarily well together. They’ve been engineered that way from the start. The Duramax and Allison downshifted to as low as 2nd gear while the engine stopped burning diesel and only pumped air at 4,150 rpm to slow the truck. The Ram, however, stubbornly stayed in 3rd gear, from 2,500 to 2,900 rpm, and picked up speed until it was forced to upshift to 4th gear to keep from over-revving. Fourth gear, for all the trucks, allowed speeds to increase over 60 mph, forcing us to apply the brakes. If the Ram could have downshifted to 2nd gear, like the Sierra, we think there would have been far fewer brake applies. The Ford’s weak exhaust brake is its Achilles heel. It had minimal effect slowing the rig and keeping our driver from getting that “white knuckle” feeling you don’t want while barreling down I-70 at night. Although the Ford’s six-speed transmission did a nice job downshifting from 4th to 3rd gear after the foot brake was applied, the wheel brakes on both truck and trailer suffered as stopping power was turned into heat. At the end of every descent from Eisenhower Pass to Dillon, the F-350’s brakes were literally smoking. Ford has excellent stopping power on flats, but it needs to step up its game in the mountains to stay even with GM and Ram. 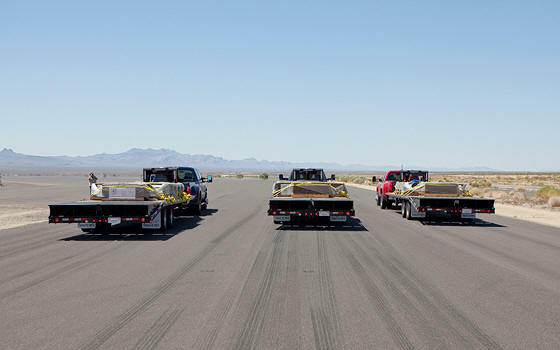 For each test — the fastest truck by time or the shortest to stop by distance – first place was awarded 100 points, and the second- and third-place trucks were assigned points relative to how close they finished to the leader. For example, if the fastest truck through the quarter-mile finished in 15 seconds (getting 100 points) and the second-place truck finished in 16 seconds, then the second-place truck received 93 points. The mandatory 4.10 rear gear set that comes with the Max Tow Package to increase GCWR didn’t help to make this combo feel smooth and well-integrated. We couldn’t help but feel that power was being lost somewhere, slipping away maybe in a torque convertor or clutch plates. Integration is probably the most impressive aspect for this truck. The way the transmission shifts is impressive. We love the range select capability in the transmission, but the noticeable absence of exhaust brake effectiveness is troubling, if not unnerving, on big grades. 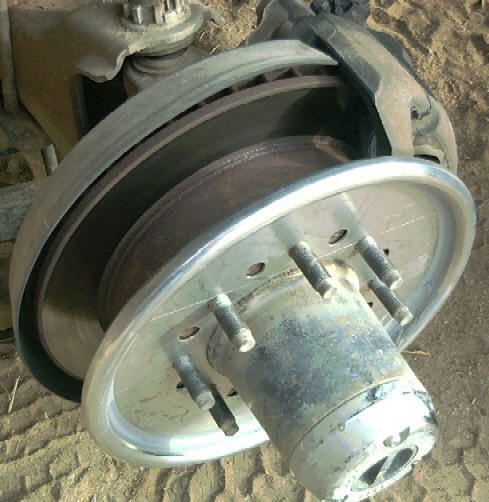 Repeated use of the wheel brakes under heavy load is going to cause issues with long-term wear and cost of ownership. We love the Ford’s rich driver information center. It’s the best trip and truck management computer of the bunch and reflects Ford’s superior ability to make life easier for the Super Duty driver/owner. We were disappointed with the lack of information displayed in contrast to the other trucks. It needs to get a better information center, yesterday. We’re also disappointed in the solution found for the DEF maintenance. The Sierra needs an accurate DEF gauge — not a low-DEF/empty warning light or an OK indicator. The DEF filler area under the hood next to the engine is awkward, and the tank sits well below the bottom of the doorsill. It’s too exposed, especially if any four-wheel driving is required. That said, if we were going to shop for a heavy-duty truck today, we’d buy the Sierra.